It's hard to believe that not only was there no Serial six months ago, there was no Serial three months ago. The hugely popular podcast, a spinoff production of This American Life, didn't even premiere until early October, but since then, it has made its way with great speed into worlds from Sesame Street to Funny Or Die. This is not only journalism; it is pop culture ubiquity, as no podcast has ever achieved it before. The last episode of the show's first season, which re-examined the murder case that put Adnan Syed in prison for the 1999 murder of his ex-girlfriend, Hae Min Lee, posted Thursday morning. On Thursday's All Things Considered, creator — and sudden celebrity of a very particular kind — Sarah Koenig talks to Audie Cornish. Koenig says she doesn't regret being as open as she was about her own reactions to people in the case, despite the fact journalists, like anyone, can be manipulated. "I'm definitely susceptible to that, I mean, there's no question. I like Adnan. I mean, I do. Like, he's a likable person," she said. "And, you know, I know him. I know him a bit." And she adds that any expectation that she have no personal reactions rings false: "I think that's fake. I think that if journalists, reporters who spend a lot of time on a story, are honest with themselves, we all have feelings about our subjects — I mean, unless you're a robot." What's the answer? "Be aware of how you're feeling and have checks on it." The conclusion of the story, it had already become clear over the course of the season, was not destined to be terribly neat, but while she may not have uncovered evidence that suddenly made clear exactly what happened to Hae Min Lee, she did satisfy herself that Syed's conviction, based on the evidence offered in court, was problematic: "I think something went wrong with this case." That's not to say she wouldn't have liked to feel more certain. "Obviously, I wish I knew. I wish I knew exactly what happened." And for some listeners, perhaps millions of you, this theme music is a siren's song, pulling you into one of the most popular podcasts probably ever, "Serial". CORNISH: It's a true crime story produced by the folks who brought you "This American Life," producer Sarah Koenig and her team spent the last year examining the 1999 murder conviction of a Baltimore County teen accused of strangling his ex-girlfriend. He's currently serving a life sentence in a Maryland prison. Koenig's podcast has spawned a massive and arguably obsessive following. Internet message boards like Reddit pick apart the episodes for clues. There are not one but two podcasts about the podcast. And Koenig herself has landed squarely in the public eye. Sarah Koenig, welcome to the program. CORNISH: If you could start by giving us just a brief synopsis of the case itself, what prosecutors alleged in the case. 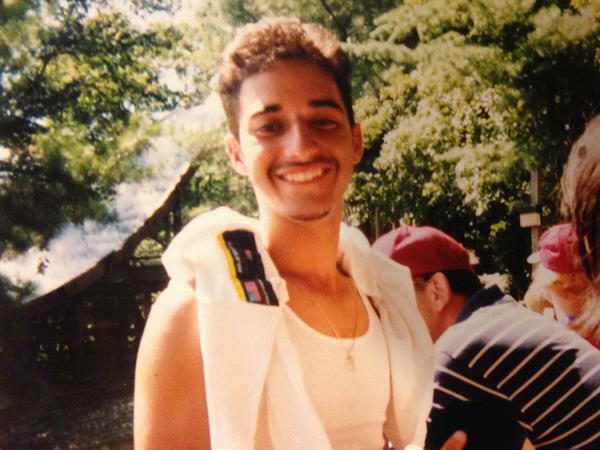 KOENIG: The state's case was that a 17-year-old high school senior named Adnan Syed had strangled his ex-girlfriend one day after school in January of 1999. They had a witness who said that he helped Adnan Syed bury this body. So that was their case. CORNISH: And as you mention, Adnan Syed is the man who was convicted for the crime. The victim was Hae Min Lee. What aspects of this case did you think were worth exploring further? KOENIG: When I first learned about the case from a friend of Adnan's family, she really came to believe he didn't do this; he didn't do this. And she saw so many weaknesses in this case. There's no eyewitnesses to the actual murder. There's really no physical evidence linking Adnan to the crime itself. So I wanted to understand what the state understood. I was just like, well, I don't understand what this - how they made this case. So let me figure out how they made this case. So that was the big question to me. CORNISH: And you spent a year on this, right? KOENIG: I spent more than a year on it. I first heard about it two summers ago and started looking into it in September of 2013 in a kind of more serious way and then turned to it full time last January. CORNISH: And you interview family. You interview friends. You go through cell phone logs from the time. I mean, you're totally transparent about what you do or don't know but also how you're feeling at any given time. For instance, in interviews with Adnan Syed, he calls you from prison. And here's a sample from one of those calls where he asks basically why you're interested in the case. KOENIG: My interest in it, honestly, has been you. Like, you're a really nice guy. Like, I like talking to you, you know? So then, it's kind of like this question of, well, what does that mean, you know? ADNAN SYED: Yeah... Oh, I mean, you don't even really know me though, Koenig. I'm - you don't. I'm - maybe you do. Maybe, you know - I don't - we only talk on the phone. I don't understand what you mean. CORNISH: So he sounds puzzled by your interest. You know, how much did you worry that you were being kind of emotionally captured by him, right? Like, listening back, do you think you did a good enough job policing yourself? CORNISH: But every time you say, I like him, I think there's, like, a bunch of people out there who think, wait. Journalists aren't supposed to say that. KOENIG: But I - I think that's a fake... I think that's fake. I think that if journalists, reporters who spend a lot of time on a story are honest with themselves, we all have feelings about our - I mean, unless you're a robot, you know? But I just feel like of course we have feelings about the people we cover. And I just think the most important thing is to catch yourself. Be aware of how you're feeling, and have checks on it. And that was crucial. CORNISH: This is the part of the process that usually journalists don't reveal, right? I've got this information. Now I've got that information. I'm not sure what this means. I'm not sure what that means. CORNISH: And do you have any regrets about exposing yourself and revealing that? KOENIG: No. No, I don't. I really don't. I mean, I think that this is what it means to do this job that we do. And if you really care about a story and you really care about the people in the story and you really care about getting it right and you care about being respectful, this is the - this is what it looks like, you know? And I think there's a lot of stuff out there in the world - just sort of like the pundit-y world that we live in - where certainty is so prized over everything else. And I just - I don't feel that way. I don't feel that way about the world, I think. (Laughter). CORNISH: Now, as the show became more successful, how did you feel about what this might mean for people like the victim's family, for people in the case who you, at times, drew suspicion towards as other possible suspects? CORNISH: But it is a little different - right? - 'cause these people are out there right now, living their lives. They're not under suspicion, right? And the re-reporting of this and the re-airing of it essentially puts them back under suspicion. KOENIG: Right, right. I mean, I think obviously the last thing I want is for someone to suffer, certainly unfairly, for the work that I'm doing. And again, I just feel like all I can say is, I think - I think something went wrong with this case. And I think that's worth reporting. CORNISH: Today you released the final episode of the podcast. And this is just a spoiler alert or warning to fans who may be worried about spoilers that we're going to talk about it a little bit. But what conclusions did you draw about the case in terms of Adnan Syed's guilt or innocence? KOENIG: Well, the main conclusion, I would say, is that based on the evidence presented in court, I think that that evidence was not what it seemed. And I think it was not strong enough to convict him. CORNISH: Given all the time and energy that you've invested in this story, are you satisfied with the outcome? KOENIG: Yeah - I mean, am I satisfied? I'm satisfied with our reporting. I really think that we tried everything we could try to work it out. You know, obviously, I wish - I wish I knew. I wish I knew exactly what happened. I wanted to - I wanted to bring some clarity to what happened to this young woman. And I think the only thing we made clear is that it's not clear at all. And so, you know, yeah, I wish - I wish we'd found out the truth of it. CORNISH: Well, Sarah Koenig, thank you so much for talking with us. KOENIG: You're welcome. Transcript provided by NPR, Copyright NPR.